Following is the letter (slightly pared, but with ‘sixties jargon and youthful pomposity preserved) that I sent to Father Robert, the Conventual Franciscan priest from whom I’d requested a letter of reference for the draft board, on June 28, 1969. Material in brackets has been added for clarity. You have asked me to explain the beliefs I hold which have led me to request conscientious objector status from the Selective Service. Let me begin by emphasizing that these beliefs are the cornerstone of my philosophy of daily living, and as such they are important and central enough to me that I am quite prepared to go either to prison or into exile from my country rather than to violate them by submitting to induction into the military forces. You may know that I almost entered the [Conventual Franciscan] novitiate in [August of] 1967; the reason that I did not was because I realized that I wanted to use the religious life as an escape from the doubt and guilt I was experiencing at that time. This was my own decision — it was something of a shock to the vocation director … . This experience made a deep impression on me, for at last I had learned the necessity of being completely honest with oneself and others if one is to act from the proper motive. Human dignity and freedom demand that every man examine himself thoroughly and, when he is satisfied that he has, to the best of his ability, cut through the pride, hypocrisy, and rationalization to his true conscience, begin to conform all his actions to the principles he finds there. This is what I have tried to do, and why I feel that I must take a stand now on the issue of war and military service. As Tolstoi once said, the only way to put an end to war and conscription for war is for all men to refuse to serve, and this is what I must do. To do anything else would be, in effect, to sell my soul for security. My conviction on this matter is simply that war, especially in its modern forms, cannot in any way be justified. I say this for two reasons. First, war and all violence seem to me to be directly opposed to the Christian concept of love. Christ taught us to love our enemies, not to kill them. I have read and re-read the words of Christ on this matter many times, and I have consulted commentaries by Catholics and non-Catholics, and it seems obvious to me that when Christ said “love your enemies” and “return good for evil” he meant exactly what he said. I have been re-evaluating my beliefs since [leaving high school]. I am no longer an active member of the Church, for I feel that the Church has become much too hung up on the letter of the law rather than the spirit, which is the spirit of freedom through love. I can find no relevance in a Church that will not accept the teachings of its God without watering them down or expounding and adding to them until they actually stifle the freedom that should grow out of genuine love for man and God. … God is love — this is all we need to know. It does not seem important to me whether or not God is personal, a trinity, or even a judge. What is important is that God exists in every part of the cosmos and that each part must therefore act in unison with him and in recognition of the dignity of itself and all other parts. * If we live thus morally, which is the same as living by love, I trust that if God is a personal God he will deal with us according to the fruits of our lives rather than the weakness and confusion of our reason. Second, I can find no justification for modern war because, by its very nature, it destroys that which it purports to be saving. Innocent non-combatants are constantly subjected to the terror and death wrought by such tactics as obliteration bombing. … There is no morality, no love, here, only the “justification” of being on the “right” side. But how can one side be right if both commit the same crimes against humanity? Certainly Christ would not condone a plan that would save one man by destroying another equally innocent man. These, then, are my basic reasons for applying for recognition as an objector to war. I am applying for 1‑O (alternate service) status because, first of all, I can swear allegiance to no one except my own conscience, and, secondly, because the duty of everyone in uniform, including medical corpsmen, is to “contribute their utmost to the success of the command of which they are a part.” In fact, that quote comes from a section of the Army field manual addressed specifically to medics. I will have no part in this destruction of human life. There is much constructive and necessary work to be done outside the military, and I would like to be free to get started. I am applying at the present time because it is only now that I am certain that my convictions are the result of a sincere search for truth rather than rationalizations caused by escapist motives — and, as I said earlier, it is only recently that my beliefs have taken a definite form with regard to the nature of God and other such questions. To help convince you that I am sincere, I can tell you that I have declined opportunities to join both the Army and Navy reserves; although I had applied to them and was put on waiting lists, when they called me I found that I could not conscientiously enter. I am confident of a continued student deferment also … . In other words, I am applying now for no reason other than that I feel I must take a stand. I am sure that you will remember my participation in the inner city tutoring program with the Third Order as further evidence of my belief in the dignity of man and the necessity for constructive action. I would like to thank you for your time and assistance, and I would also like to request that if you feel that I am sincere, but you do not agree with my beliefs, you would mention this in your letter. If you would like to discuss this further, please call … . 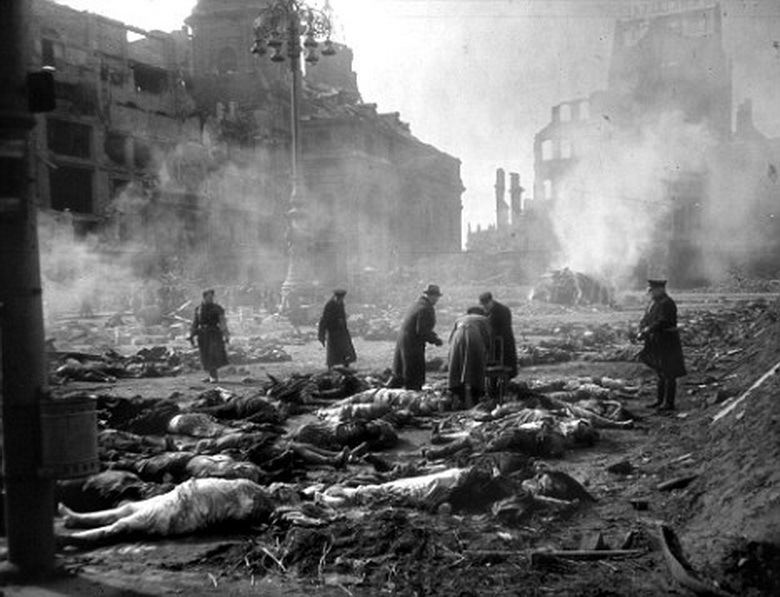 Scene in Dresden after Allied fire-bombing. * At the time, I was moving from Catholic theology to the panentheism of writers such as Aldous Huxley and Alan Watts. In the “Preface to the New  Edition” of his Behold the Spirit, Watts would define panentheism as “the conception of God as the total energy-field of the universe … in which every discernible part or process is a sort of microcosm or hologram” (p. xviii). Although today I would include such tropes under “‘sixties jargon,” they helped me begin the reframing of my religious training and experience. I’m impressed that you wrote such a letter at a young age. I think that the war and the draft made many of us grow up quickly — among both those who fought and those who resisted.